I started clicker training Archer from day 1. He’s the first puppy in training I’m exclusively using clicker training for teaching new behaviors. Over the years we’ve used many different tools for training our puppies, but clicker training is a little different as it requires a few more pieces to the puzzle. Fortunately, these pieces are still very easy to carry around during any puppy training exercise. 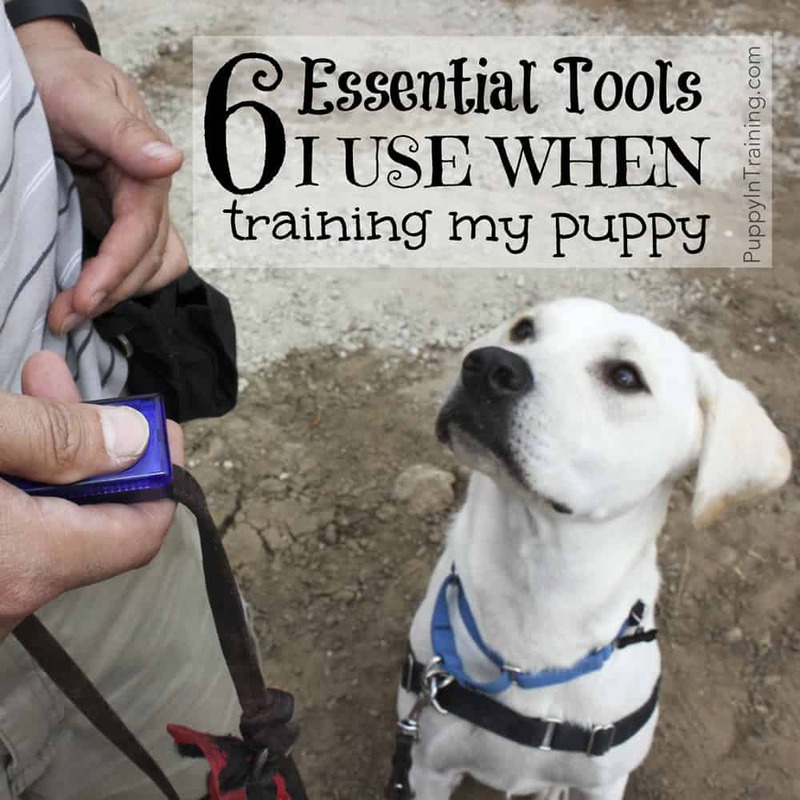 So, what are these 6 essential tools I use when training my puppy? Check out the picture above and see if you can identify all 6 before moving on. Maybe I should change the title to 6 Essential Tools I Use When “Clicker” Training My Puppy since this list is specific to clicker training. There’s more than one type of clicker available, but we go simple and use the standard box clicker for training our puppies. If you plan on clicker training your puppy then do some research and find a clicker you like. They even have quiet clickers just in case your puppy is noise sensitive. There are thousands of treats available to use during training. We feed our dogs Wellness and either use kibble as treats or Wellness Core Air Dried. We like the Wellness Core Air Dried for several reasons. 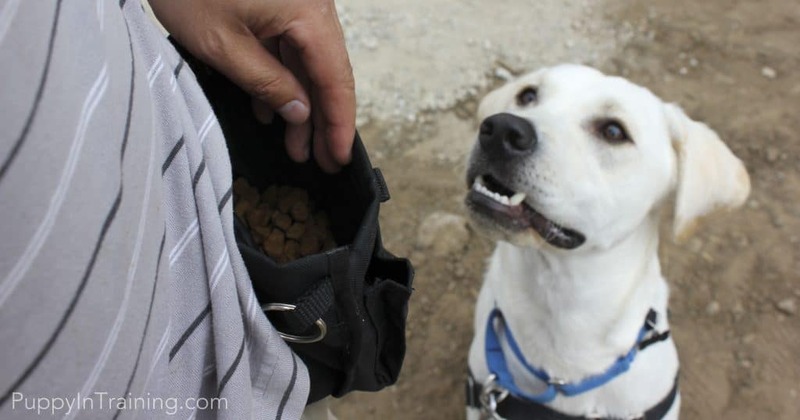 A few traits we really like about Wellness Core Air Dried for clicker training are:#1. treats are soft, #2. small, and #3 you get a lot rather than your normal tiny bag of treats. Warning: If you use the Wellness Air Dry Ocean Formula they are stinky! Which is great for motivating your puppy, but not so much for the fishy smell left on your hands. The hinge recently broke on our treat pouch after a few years of use. Besides the durability we really liked our Premiere (now PetSafe) TreatPouch. The hinge would keep the pouch open for easy access to treats or closed when not in use. UPDATE: the plastic clip broke off the back…now it’s really time for a new treat pouch. This is the updated version of the treat pouch we’ve been using for the last few years. We checked it out at our local PetSmart and it appears to be pretty much the same pouch we have at home. Sorry folks, but we don’t have a link to a recommended leash for training your puppy. Our leather leash is 10 years old, warn in, and soft as can be. We love the leather leashes over the nylon as they are much softer on your hands. If you can find a good leather leash let me know in the comment section below. UPDATE: Guide Dogs for the Blind has the exact adjustable leather training leash we love and use with all of our puppies in training. We recently changed to a Martingale Collar based on suggestions from trainers at Canine Support Teams and Wags and Wiggles. We heard these were originally designed for Greyhounds (heads the same size as their necks) so their head wouldn’t slip out. After an incident we had with Linus slipping his flat collar to chase a coyote across the golf course 🙁 we’ve found the martingale to be a good choice when out and about as it will tighten, but not choke your dog (make sure and have it adjusted properly). #6 Easy Walk Harness – We really like the Easy Walk Harness used in conjunction with our Martingale Collar. While it doesn’t totally deter pulling it does help by turning your dog slightly when he tries to pull forward. If you look at our pictures we like to attach our leash to the martingale collar and easy walk harness simultaneously. We’ve found this to be the best setup when working with Archer. So what do you guys think? That’s not everything we use when clicker training our puppies, but I would consider these the “Essential Tools”. However, if you look closely at the pictures you might see another tool we use with our puppies (not really a training tool). Did you guys catch the other tool in the pics? 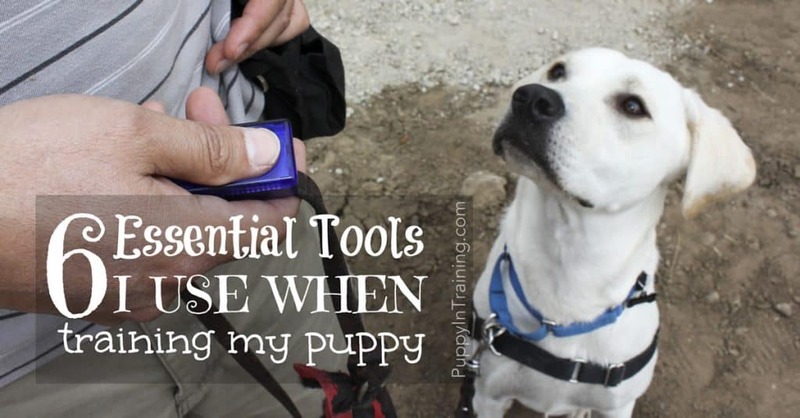 What are your essential tools when training your puppy. Tell us about your experiences training your puppy in the comment section below. Oh, and he has never growled or barked at anyone before, and he as been to different stores, parking lots, and the mall twice. Thank you for training service dog puppies! If you haven’t seen that behavior before I would guess that it could have been stress related. I would have done the same as you. Anytime I take my puppy out with me I’m always prepared to leave just in case the situation is to stressful for my puppy. Good luck with your puppy in training! Happy Holidays! Oooh yes, I absolutely love my leather leashes and my clip-on treat pouch. I’ve heard good things about the ones with the magnetic closure, so I might actually look into upgrading to one of those. The one I currently have needs to be drawn shut with a string. I love my leather leash! And they get better with age. I have a treat pouch with a draw string and the PetSafe one in the picture. Let me know how you like the treat pouch with the magnetic closure. I’m always looking for better products to help with the puppy training. I have an 8 month old labradoodle. He’s crate trained and does wonderful. My problem is this. We are going to have to move his crate to another room in the house. I don’t work and so he’s only in the crate at night and maybe a few hours a week during the day. Any suggestions on how I can make this transition easier?